Published March 6, 2019 By Anna T. This post may contain affiliate links. Regardless, I only recommend sites I've researched and/or used and trust. Direct sales is definitely not for everyone. Just as it is with any other type of home business, there is an initial investment. You also have to put a lot of time and effort into growing your business to start earning money. While it's true there are thousands of people across the country making five and six figures a year through direct sales, it's safe to say there are many more who are not. Still, if you've ever considered getting involved in direct sales, jewelry companies are pretty popular at the moment. And, as many direct sales consultants will tell you, these products often sell themselves if you make a point to wear the pieces while you're out and about. Plus, now that social and online sales are such a big thing, you no longer have to rely on just your inner circle and acquaintances to make sales! Consultants for Stella & Dot, also known as “Independent Stylists” earn 35 percent commission on sales. Stella & Dot pays your commissions out weekly to a Stella & Dot debit card. Right now (through March 31, 2019), Stella & Dot is having a special where you can launch your business for $99 and get $500 in Stella & Dot products to start you off at that price. You can go here to sign up as a Stella & Dot stylist. If you are interested in starting up a home business selling jewelry without much in the way of funds to invest, Avon is hands-down going to be your cheapest option. Avon is not only a brand EVERYONE recognizes with beautiful and affordable jewelry (among other items), but they also have one of the cheapest start-up costs — just $25! So even if this does not work out for you, you are not out much money. Go here to sign up as an Avon consultant. You will earn 20 to 40 percent commission on jewelry sales as a Chloe + Isabel jewelry merchandiser. The start-up cost varies, but the most recent info I can find is around $170. For this price, you get $700+ in free jewelry, a carrying case, marketing materials, and a personalized online boutique. The only quota to remain active is that you have to have at least one personal sale within six months. Commissions are direct deposited to you monthly via a Visa debit card they set up for you. Go here to sign up at Chloe + Isabel. Origami Owl specializes in trendy, completely customizable jewelry. You can earn between 20 and 50 percent commission on jewelry sales. Origami Owl also has three different options for starter kits, ranging in price from $189 to $999. The cheapest kit comes with over $700 worth of products, and the most expensive kit comes with over $4500 worth of products. You can choose between weekly or monthly payments on your commissions. Go here to get started at Origami Owl. One of the cool things about this company is that all their jewelry is just $5 to buy. After you purchase your starter kit, you earn a flat 45 percent commission on all your sales. There are three starter kits you can choose from, priced at $99, $299, and $499 containing many pieces at a significant discount for you. In addition to jewelry, the kits also come with marketing materials and business tools. Go here to join Paparazzi. As a Premier “jeweler,” you'll earn 50 percent commission on the jewelry you sell. The price to sign up will vary depending on what promotions are currently going on, but it's currently $395 to get started and get your starter kit of items. Go here to sign up and sell Premier Jewelry, or learn more about how it works. You can get started as a Magnolia and Vine “style consultant” for as little as $29 or as much as $349, depending on which starter kit you choose. The $29 kit has a retail value of $90+, and the $349 kit has a retail value of over $1,500. There are other kits in between these two amounts as well, so you can easily find something that will work for your budget. They give you a 20 percent commission on sales with a potential to build that up to 25 percent after making $1500 in sales, plus a 50 percent discount on all purchases you make for yourself. You can sign up as a style consultant for Magnolia and Vine here. This company specializes in magnetic, interchangeable jewelry products that you can personalize. Magnabilities pays 30 percent on all sales of their products. You can start your own business with them for $50 and receive an enrollment kit with $300 of products inside. They do give you your own website which is free for the first month, but you'll have to pay $12.95 a month to keep it going after that first month. Go here to learn more about selling with Magnabilities. Plunder specializes if affordable jewelry for the “everyday” woman. You can sign up for $99 at the least expensive level and get $230 worth of Plunder products to start you off. Your commission on sales will vary from 20 to 30 percent depending on your sales and your rank within the company. Go here to learn more about selling jewelry with Plunder Design. This company specializes in affordable jewelry from a brand (Swarovski) you most likely recognize. Most of the jewelry is less than $50 to purchase. The least expensive starter kit Touchstone offers is $139 (you get $600 in products for this price). You'll earn between 25 and 40 percent commission on your sales of this jewelry. Go here to learn more about selling jewelry with Touchstone Crystal. So that sums up our list! If starting a home-based jewelry business interests you but you can't actually make jewelry yourself, you can take some time and research all the companies above. Browse their websites and products, read about how and why they each got started, see which one has a “style” that appeals to you and people you know. Also, pay attention to the prices of the jewelry and think about what your likely client base can afford. 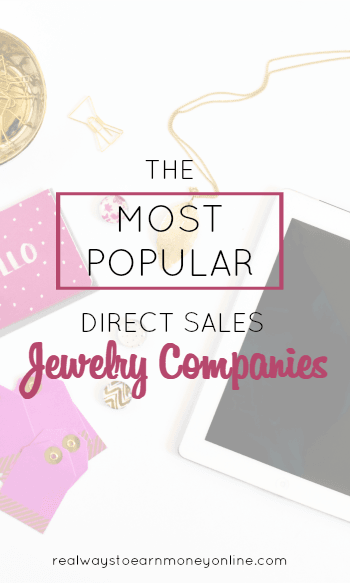 One advantage to joining any one of these companies is that, even if it doesn't work out, you get to keep the starter kit you paid for and all the discounted jewelry in it. So, you can just look at it like you spent the money to get yourself a nice selection of new jewelry. Good luck if you decide to pursue any of these opportunities! This post originally published on May 3, 2016. Updated and republished on March 6, 2019.